You can also check out our 3 free library solutions without making a GTORB account in our GTO Dojo here: http://gtorangebuilder.com/#gto-dojo to get an idea of what a GTORB flop solution looks like. 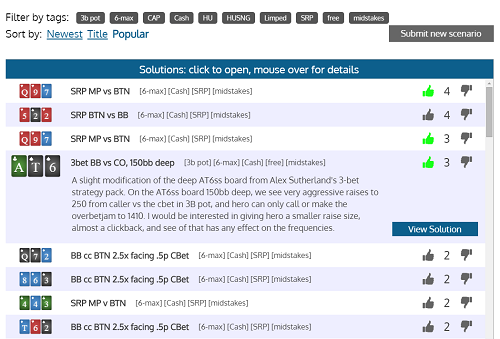 Just click the "View the GTORangeBuilder Flop Library" button and the free solutions will be right at the top with the "free" tag. With hundreds of GTO flop solutions instantly available at your fingertips for just $20 the library pass is an incredibly effective way to study GTO play at a great price.